The proper way to install boiler flues is to insert the flue through the boiler’s two flue sheets and then using a special “rolling expander” to carefully expand the flue tight in the flue sheet holes. This process is started by figuring out just how much the flue needs to be expanded to fit the flue sheet tightly so as not to leak. The roller chosen for this project was manufactured by Elliott Technologies who provide excellent support in how to properly roll a flue. Based on Elliott's recommendations, tubes with a 0.500" OD, 0.402" ID, and 0.049" wall thickness should be expanded to 0.410" ID nominal for the bottom flue sheet. Great care must be exercised not to over-roll the flues as the possibility exists for adjacent tubes to be affected through deformation of the tube sheet holes. The tube expansion amount for the lower flue sheet tubes was taken as the minimal amount of expansion required as the flues would later be welded after rolling and thus leaking would not be an issue. Using a 0.500 x 18 Elliott tube roller, a set of inside diameter micrometers, and the test fixture, accurate measurements of the rolling operation were obtained as the roller was set to provide the necessary amount of tube expansion. 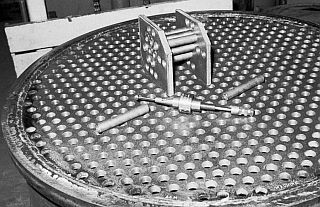 Once the settings of the tube roller were obtained using the test fixture, a tube was inserted in the boiler and rolled on the bottom flue sheet only. For the first couple of tubes measurements were taken to insure rolling on the actual boiler occurred as it had on the test fixture. After the first dozen tubes only spot checks were performed while finishing the 636 tubes that had to be inserted and rolled. Readings of a random sample of rolled tubes (on the order of 10% over all parts of the tube sheet) provided expansion measurements between 0.410" ID and 0.412" ID as typical. The unrolled internal diameter (ID) of unexpanded tubes provided measurements of 0.401" ID to 0.403" ID.